October 5 marks the World Teachers’ Day to honor the services of teachers whose efforts bear the greatest impact on the spirit and thoughts of future generations. In Iran, the situation is just the opposite. For their legitimate trade union activities, teachers’ rights defenders have been sacked without justification or forced into early retirement; subjected to reprisals for peacefully protesting to claim unpaid wages; arbitrarily arrested and detained; and sentenced to long prison terms on spurious national security offences. Amongst the prominent trade unionists and teachers who have been targeted for their legitimate activities are Mahmoud Beheshti Langroudi, Esmail Abdi, Mohammad Habibi, Mohammad Sani, Hashem Khastar, Alieh Aghdamdoust, Rahman Abedini, Mohammad Taghi Fallahi, Esmail Gerami, Mokhtar Assadi, Iraj Tobeiha, etc. In a most recent case, at least six teachers were given a nine-month suspended prison sentence and a flogging sentence of 74 lashes in September 2018 for their peaceful participation in gatherings on May 10, 2018. 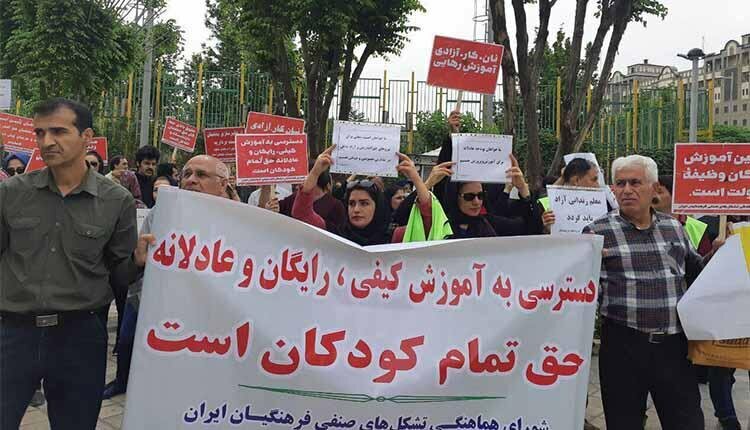 May 10 protests in Tehran and several other cities were organized by the Coordinating Council of Iranian Teacher Trade Associations to protest what it says are poor salaries for teachers and insufficient funding of the public education system as a whole. Responding to the teachers’ legitimate demands, Iranian security forces used force to break up the rallies, beating several protesters including women. On the eve of World Teachers’ Day, Iran Human Rights Monitor condemns the unjust sentences issued for teachers and takes a glance over the conditions of imprisoned activists. Mohammad Habibi, 29, has been detained since March 2018 after he was arrested by the Islamic Revolutionary Guard Corps (IRGC). All the while his activities were within the framework of the Iranian Teachers’ Trade Association (ITTA) and entirely legal and with permission. But the IRGC and the Intelligence Ministry have a problem with any kind of activity, especially when trade unionists start to organize. Mohammad Habibi was first arrested after being battered on Saturday, March 3, outside the school in Tehran where he taught, in front of his students. He has said he was pepper sprayed and beaten by Revolutionary Guard officials who did not identify themselves and who forced him into an unmarked car. He was beaten up again when the security agents dragged him to ransack his home. Mohammad Habibi was then taken to a detention center in an undisclosed location that was run by the Revolutionary Guards and remained there in solitary confinement until 19 March.During this period, he was denied access to his lawyer and only allowed to call his family twice. He was subsequently transferred to Evin prison and released on 15 April 2018 after posting bail of 2.5 billion rials (US$60,000). On 10 May 2018, while out on bail, Mohammad Habibi Mohammad Habibi participated in a peaceful gathering of teachers in Tehran against the poor economic circumstances of teachers – both retired and active – and the lack of sufficient funding for public education. He was arrested during the rally outside the Iranian government’s planning and budget organization building in Tehran, and taken to the same secret detention centre in which he had been held in March and early April. He was held there in solitary confinement for several days, while his family remained unaware of his fate and whereabouts, and then moved to Fashafouyeh prison, south of Tehran. Mohammad Habibi was denied access to medical care for the injuries he sustained during his violent arrest until his brief transfer to Imam Khomeini hospital in August. On 3 September he was transferred to Evin prison. Mahmoud Beheshti Langroudi, is another teacher serving a prison sentence in Iran for his trade unionist activities. In April 2010 he was arrested again for protesting the mistreatment of his imprisoned colleagues, including Rasoul Bodaghi, after they were arrested by agents of the Intelligence Ministry, and was held in solitary confinement in Evin Prison for two months before being released on bail. Until his transfer to prison on September 12, the labor activist was sent numerous summons from the prosecutor’s office threatening to confiscate his security deposit unless he reported to prison to serve his convictions. From April to May 2016, Beheshti-Langroudi went on a 22-day hunger strike that led to his release on May 11, 2016, pending the outcome of his appeals. Esmail Abdi, a 44-year-old high school teacher and former secretary general of the ITTA, has been serving a six-year prison sentence. Esmail Abdi was arrested on 27 June 2015 after he went to the prosecutor’s office in Evin prison to inquire about the travel ban imposed on him. He had been prevented from travelling to Armenia to apply for a visa to attend the 7th Education International World Congress in Canada in July 2015. Before his arrest, intelligence officials had repeatedly summoned Esmail Abdi for interrogation. During these interrogations, intelligence officials warned him against associating with international organizations such as Education International, a global teacher’s union, and said his participation in international gatherings was a “red line.” His sentence of six years in prison for “spreading propaganda against the system” and “gathering and colluding to commit crimes against national security” was imposed for his peaceful trade union activities, including associating with Education International and organizing peaceful demonstrations by teachers outside parliament in April 2015 to protest against poor wages, the inadequate education budget and imprisonment of teacher trade unionists. Mardani, 35, was arrested in Tehran at a protest on January 18, 2018. He has been sentenced to six years in prison, a two-year ban on his social activities, issued by Judge Abolqasem Salavati of Branch 15 of the Revolutionary Court. The charges brought against Mardani were “spreading propaganda against the state” and “assembly and collusion against national security.” He is behind bars waiting for a decision on his appeal. Mardani was studying literature at the University of Tehran in addition to working as a teacher and educational adviser at high schools in Karaj, west of Tehran. He has been denied his monthly salary because of what his employer has described as an “unjustified absence” from work since his arrest. A source with knowledge about his case said that the charges brought against the teacher is related to his nonviolent participation in teacher’s protests during 2015. Iranian Kurdish teacher Bakhtiar Arefi, who has been described by locals as a caring educator with years of honest service, has currently been serving an 18-month prison term at a prison in the northwestern city of Mahabad. An appeal court in the northwestern city of Urmia has confirmed the sentence for the Kurdish teacher. Authorities initially arrested Arefi, from the city of Sardasht in northwestern Iran’s West Azerbaijan province, in 2014. He was released on bail after one month in detention and remained free pending an appeal of a three-year sentence imposed by a provincial court. The appeals court in Urmia confirmed a prison sentence but reduced the term to 18 months.